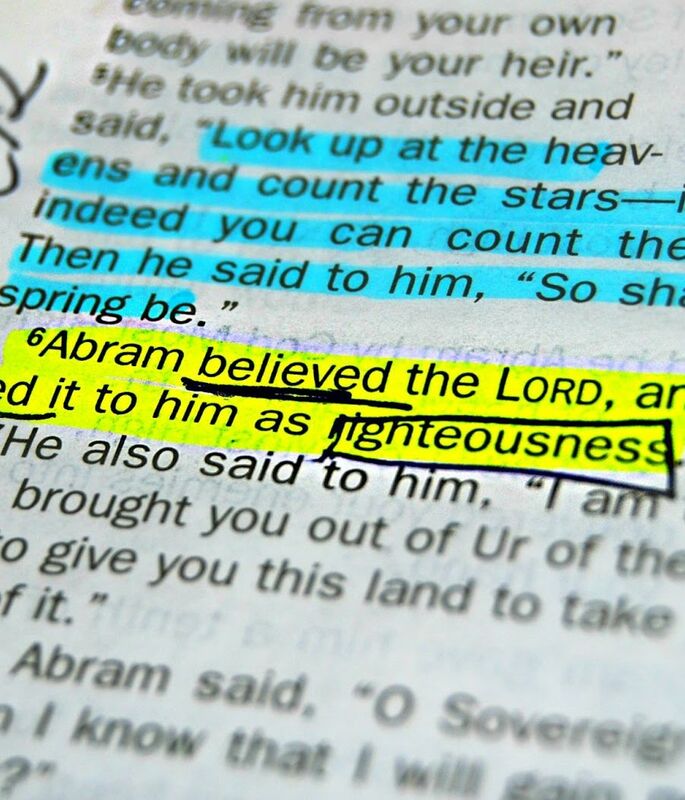 Paul shows that with Abraham long before the Law was given, Abraham’s faith was “reckoned” to him as righteousness. In secular Greek, the verb λογίζομαι (logizomai) was used for determining the amount of a debt (Demosthenes Or. 27, 46). The LXX uses λογίζομαι to translate חשׁב, a verb that is normally translated in as “think” or “account,” but it is used to count some action as “guilt” or “sin.” Psalm 32:2 is a good example of this: “blessed is the man against who the Lord counts no iniquity.” In Genesis 15:6 (quoted by Paul here in Romans 4:3), the word is use to say that Abraham’s faith was considered to be as righteousness. Heidland (TDNT 4:284-92) makes the point that there was nothing intrinsically good about the belief of Abraham. It is only because it pleased God that his faith was considered to be righteousness. This is in contrast to the view of the Jews of the first century who saw Abraham’s faith as meritorious. For example, in 1 Macc 2:51-52 says “Was not Abraham found faithful in temptation, and it was imputed to him for righteousness?” This is an important parallel text to Paul since it uses the same exact words as Gen 15:6 cited in Rom 4. The first seven chapters of the Apocalypse of Abraham are a narrative of Abraham’s realization the gods his father Terah makes are nothing but wood and stone. After Abram has demonstrated that he is a good monotheist, God rewards him with the Abrahamic Covenant. In Jubilees Abram is a righteous man who was already seeking the God of Heaven when the Lord calls him. In this book, the Lord gave Abram the ability to read Hebrew, a language which had not been spoken since the time of the fall. Paul gives this word an additional theological meaning in the New Testament. Paul uses the word here and in Galatians 3:6 to described God’s declaration on the believer in Christ, making him righteous. This is the crux of salvation, moving the believer from death to life. For Paul in Romans 4, it is the faith of Abraham in Genesis 15 that “counts” as righteousness rather than his works (submitting to circumcision in Gen 17, sacrificing his son in Gen 22). But how does this work? How is it that Paul can compare Abraham’s belief in the promise of a child to a person in the present age believing in the death of Jesus as payment for sin? Does Romans 4:22-25 say that God “imputes righteousness” to the believer on account of their faith, or does this text say that God declares the believer righteous because of the faithful act of Jesus on the cross? There is no scientific way of proving that believing in the death of Jesus is payment for sin. We will never be able to prove these things. Nevertheless we believe them to be true. The two aspects of this faith are that we believe something that we cannot prove. Romans 4:19-20 talks about how it was seemingly impossible for what God had promised to Abraham to be true and yet Abraham still believed. This faith is what brings this imputed righteousness. This is not to say that Abraham earned his salvation just as we did not earn our salvation. It means that the way salvation is received is through faith. Galatians 3:22 talks about the fact that what was promised is given based on faith in Jesus Christ. Longenecker describes the reward of faith as being inclusion in the “family of faith” and describes that Abraham’s reward came before he did anything and so his reward of being the father of many nations came from faith just as our inclusion comes from faith (TTP 181). The righteousness imputed to the believer results in inclusion in the family. This comes from faith in Jesus Christ. Should it be based completely on “the faithful act of Jesus on the cross” then all would be saved since that act was already accomplished. The requirement of belief or faith in this fact means that anyone can be saved but still demands a requirement of faith on behalf of the believer. I think that Paul can compare these two different ideas because a person can put forth just as much faith believing that they are going to have a child at such an old age when it seems physically impossible as believing in the death of Jesus as payment for sin. It takes a huge amount of faith and trust to get through both of these situations. I think that Romans 4:22-25 is saying that God is declaring the believer righteous because of the faithful act of Jesus on the cross. I don’t think it is that hard to compare Abraham’s belief in the promise of his child to a person in this age believing Jesus’ death paid for our sins. My reasoning front hat is partially based on the timeframes of each. In Abram’s time, Sara was far too old to be able to conceive a baby, and had been barren her whole life. It would have taken a great of faith that this God, our God, would give him a son in his old age. He was able to rejoice in the rewards for his belief, because not only was that promise fulfilled, but the Abrahamic covenant was promised to him as well, going beyond his wildest imagination. Nowadays, people are less inclined to believe in God, because they want facts, and proof. I see proof all around me, personally, but it does take a great deal of faith for a person of this age to believe in this God of the Bible who has been written about and know about for millenniums now. The article discussing this, asked if it was really the faith shown by Abraham counting as righteous, or Jesus’ death on the cross for us that should count as righteousness. I think it is pretty obvious that it takes both, how could we get saved excep by Jesus’ sacrifice for us, and that would still not work for us without true belief in what He has done for us. Longenecker and Still mention how Paul, “emphasized faith as a condition for this salvation,” (TTP, 178). How could we gain salvation and righteousness without faith and what Jesus did for us? The simple answer is that we cannot. I think Paul used this comparison to show that “this story [had] significance not only for the circumcised Jew but also for the uncircumcised Gentile” (TTP 181). All along, believing in God has always been something He wanted us to do, and not just some new covenant because Jesus died on the cross. Following the law wasn’t all God wanted for us. Abraham is the father of the Jews (and the Christians), and he was not circumcised yet he was still righteous in God’s eyes because of his “faith [was] properly exercised” (Romans 4:3, 10; TTP 181). So now, even today, we need to be faithful just like Abraham was to God. It’s a matter of faith Abraham obviously had faith in the future promises of God. God promised an offspring and Abraham believed. God said that the offspring would be more than the stars in the sky and when Abraham is told to sacrifice his son he believe God would pull through. We have faith in God today. He promised to return and promised us eternal life and we have to wait in anticipation of that fulfillment. It’s about the faith in God’s promises. Hebrews tells us “Now faith is the assurance of things hoped for, the conviction of things not seen” (Heb. 11.1). We, as well as Abraham, have (had) hope that God will complete his promises even if it seems impossible. Jesus just supplied us with the sacrifice required and with more promises.